Australian products and produce are manufactured or grown locally to meet our country’s high standards, so it makes sense to buy things that have been made right here in Australia. The best way to identify these goods is by looking for the green triangle with a golden kangaroo. The logo shows that a product is made or grown here. Also, it often tells you if a company is Australian owned. Following is the Australian Made education material posted on FTfs. Focuses on promoting the benefits of purchasing Australian Made products, the history of manufacturing in Australia and the Australian Made, Australian Grown logo. Facts for students, lesson and activity ideas, student activity sheets and extra resources including an interactive quiz and jigsaw puzzle. 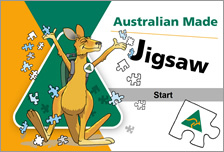 A simple, interactive jigsaw puzzle to entertain your students. Note: Further Australian Made resources are available on this site. 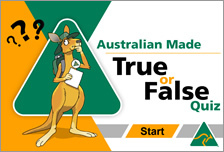 An interactive true/false quiz to test student’s knowledge about Australian made and grown products.